The oldest direct date archeologists have for an artifact in Arkansas is for this Breckenridge Dalton point. What does this mean to archeologists? First, a Dalton point is one of several sub-varieties of spear point that occur in the earliest part of the Archaic Period, which began around 9000 years ago. The only older points found in Arkansas come from what archeologists call the Paleoindian Period. The most common point type in the Paleoindian period is called the Clovis. Clovis points are found in the Ozarks but so far we do not have a direct date on one from anywhere in Arkansas. Moreover, Clovis points have never been found in bluff shelters. So the Dalton point pictured here is the oldest kind of point that is found in bluff shelter sites. The fact that we have a radiocarbon date for this point is exciting because direct dating of points requires a fairly unusual set of circumstances. This is because a stone tool cannot itself be dated. The most common absolute dating technique in archeology, called radiocarbon dating, requires a piece of organic material. To date an inorganic object like a stone tool or a piece of pottery, you must find it in direct association with something organic that you can be sure is the same age as the inorganic object. You then submit the sample of organic material to a lab where physicists count the number of carbon 14 isotopes to determine the age of the sample. They return a date expressed as a range of years before the present. The location of the Breckenridge Dalton point recovered during 2012 excavations at the Breckenridge Shelter site in Carrol County, in relation to the C14 sample. 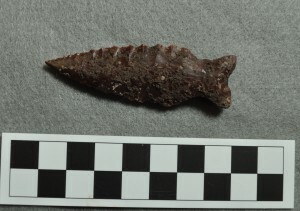 In this case the Breckenridge Dalton point pictured here was found in a deep excavation unit resting on the bedrock of the shelter. In a small area under a piece of rock that had fallen from the roof of the shelter, excavators discovered a deposit of ash with stone tool debris, shell, and animal bone. Nearby was a hearth containing charcoal. Near this area was the Breckenridge point. Charcoal from the hearth was sent to a lab to be dated. The connection between the point and the hearth is very well established. Because both objects were sitting on bedrock, close together, and sealed under a piece of rock from a roof fall episode, it is very likely they were left there at the same time and have not been disturbed since. The association is good so the date on the charcoal gives us a good idea of the age of the point—ca. 9765–9555 years old.